As the world's leading independent manufacturer of X-ray generators and Monoblock® X-ray sources, Spellman High Voltage is proud to offer the Editor HFe Series of high frequency diagnostic X-ray generators. 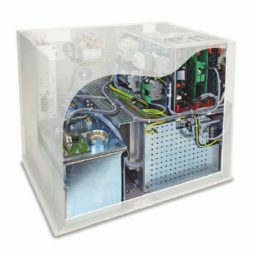 The Editor HFe X-ray generator series ranges from 40 to 80 kW. These generators are compatible with most X-ray tubes, image intensifiers, flat panel detectors, and have a flexible digital and DR interface. With its’ modular construction and flexible design the HFe series can be easily installed, maintained and integrated. Full featured Radiographic or R/F control consoles are available as well as anatomic programming and integrated DAP. The HFe series is also offered with dual X-ray tube control and high speed starters.